THE Scots council responsible for the trams fiasco is in line for an award – for the UK’s best town centre. Despite being blamed for endless roadworks and loss of retail business, Edinburgh Council could pick up a national award for increasing the number of shoppers and the amount they spend in the city. 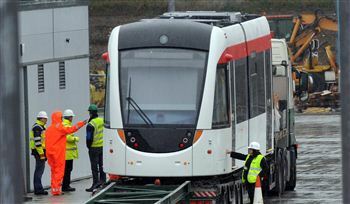 The news was greeted with incredulity by critics of the trams project, who described it as a “diabolical liberty”. Many city centre roads, including Princes Street, have been dug up leading to bitter complaints from retailers that their business has been severely damaged. But that has not stopped the Association of Town Centre Management nominating Edinburgh City Council for “driving footfall and increasing spend” in city shops in nine areas. According to the association the awards “showcase the best practises and high standards being achieved”. One of the areas is Leith Walk, which was dug up for tram lines only for that part of the project to be scrapped. Ray Borland, owner of a sports shop in the city’s Leith Walk, was furious at the nomination. “It would be a diabolical liberty if they won,” he said. “The tram works have left the street in a mess. The council have done nothing for our business. “They shouldn’t get an award – they should all be sacked. “This makes me so angry. They have been nominated for increasing footfall, but once I couldn’t even get into my shop because of the tram works. Official stats published by The Essential Edinburgh Trends Report earlier this year footfall dropped significantly in key areas affected by tramworks throughout March, compared to the same period last year. In one of the hardest-hit streets, Shandwick Place in the west end – which has been plagued by roadworks for several years – the number of shoppers plunged by one-third, from 373,600 to 195,700. In Princes Street, there was a 14.2% fall in pedestrians to 834,350. Independent MSP Margo Macdonald, said: “Like many people in Edinburgh, I am surprised that the council have been nominated. Graeme Birse, Deputy Chief Executive of Edinburgh Chamber of Commerce, disagreed with the award nomination. “The overall experience of most retailers this year is of a decline in footfall in stores,” he said. In January the council proudly boasted that it had received a Gold Investors in People award for its productive workforce and reduced sickness rates among staff.